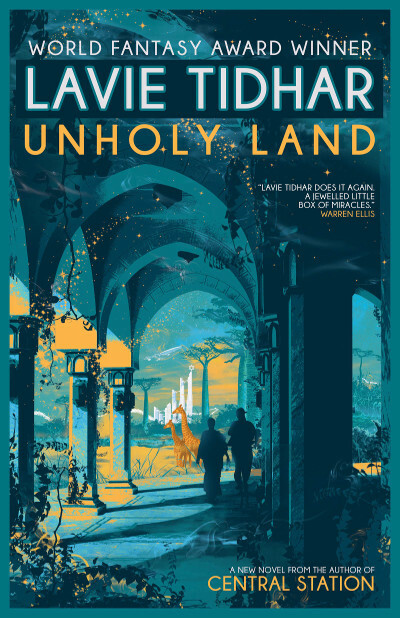 Lavie Tidhar, Unholy Land. Tachyon Publications, 2018. Pp. 288. ISBN 978-161696-304-0. $15.95. The narrative of Lavie Tidhar’s novel ducks and dives like a prizefighter, leaving his reader reeling. The protagonist, Tirosh, slips between worlds: the war torn lands of the Middle East, contemporary Berlin and other imagined worlds brought to shimmering life by Tidhar’s close observation. These are the ‘could-have-been’ worlds with elements of historical fact but steeped in mythology and fraught with darker perils and hints of monstrous beings and magical apparitions. Tidhar writes well and evokes the Middle Eastern bazaars and their inhabitants with rich detail. There are some wonderfully curmudgeonly merchants emerging from their cluttered surroundings to harangue their visitors. Their Yiddish slang rings true to life. Tidhar was born on a kibbutz and therefore writes from experience about the Middle East and its social economy. Equally vivid are the sudden terrorist explosions and the casual military violence that break out in these pages. Tidhar addresses terrorism in a dispassionate, non-judgmental way which left me constantly wondering whose side he is on. But Tidhar does not take sides. For him fantasy is a way of exploring the political and social alternatives which seem to be beyond the imagination of the current generation of leaders. Tidhar has done his research. The idea for a Jewish state in Africa was a reality. The British Uganda Programme was set up to investigate the feasibility of creating a Jewish homeland in Uganda and an expedition was launched in 1925. Could everything have been different? Could the holocaust never have happened? Tidhar has done a marvellous job of speculating. Lior Tirosh, a pulp fiction writer who, amusingly, gets tangled up in a pulp fiction plot of his own when he agrees to carry out a commission for his agent and fly to Ararat City, the capital of Palestina the Jewish homeland in Africa. There’s a distinct air of melancholy about this character, who pines for his lost son, Isaac. We are never completely sure what happened to this boy, did he die, or was he swallowed up by the shifting time states that affect everything in this novel? When Tirosh discovers a dead body in his hotel room, murdered by accident and finds that he was the intended target, he is forced to set off on an unexpected journey to evade his pursuers. A first person narrative is taken up by Bloom, Head of Intelligence Services in pursuit of Tirosh. His voice and thoughts add a rather chilling edge to the story, although this character also has his doubts and insecurities. Nur Al Hussaini’s story is told in the second person, a technically difficult and risky strategy for a writer. She is a hit-woman dispatched to assassinate Tirosh, constantly escaping from the consequences of her own actions. So we have these three main characters: the pursuing and the pursued. Tidhar has the skill to pull off these wildly different POV. Each character has his or her own unique voice. The effect is challenging, complex and occasionally a little confusing. This is a novel that forces the reader to keep track, to think. Tidhar takes a risk in demanding that his reader holds these points of view in mind whilst negotiating the rapids of his narrative, yet in doing so he has created something interesting and somehow heady. Tidhar’s writing deals with shifting states of time and his style is similarly shifting. He gives us the wonderful, rich detail, the subtle evocation of urban and rural landscapes. But there are also some madcap chase scenes and some decidedly pulpy encounters that seem straight out of a Fleming novel. He makes some very interesting comments about the ways in which airports take passengers into a different mode of being, drawing interesting parallels between the time-shifts of his characters and the sudden transitions air passengers experience as they travel across time zones and cultural spheres. Tidhar also conveys a decidedly black humour in the dialogue which helps to lighten the mood. Unholy Land is by turns virtuosic and frustrating. I think what really interests Tidhar is the point where imagination and reality meet. Given that half of what we imagine to be reality exists in our minds only, this is fruitful ground for any fantasy writer. But there are times when he walks this ground reluctantly and I wished he’d give full rein to his imagination. The sloth-like Nandi bears, for example, are sketched in only briefly, a bit like a sideshow. In his afterword, Tidhar comments that he feels eternally displaced, that he would like to escape into fantasy. “But there is only one world, imperfect as it may be, and fantasy provides no escape.” Yet he has shaped this fantasy for his readers. It is his response to the dilemma of life on this impossible planet. For Tidhar as for Tirosh, the writer in the novel, “Writing is a weapon. Words have power.” So why does he, again in his afterword, say that he often thinks of himself as a pulp writer with delusions of grandeur? Is it mere honesty? I don’t think so. I think he is acknowledging his limitations but at the same time attempting to go beyond, to take his readers on a reflective journey, to speculate on alternatives. Trying to unscramble the complex relationships between Tirosh, Bloom and Al-Hussaini throws up all kinds of dilemmas for the reader: it demands that we question our perception of history, human motivation and the forces of change and conservatism. Tidhar doesn’t provide answers but he is very good at posing questions. In casting himself, as a writer, as the agent of the novel’s imbalance, he seems to be fusing his own autobiographical history with a range of alternatives. Unholy Land is fantasy for the thinking reader—a subversive tilt at the forces of conservatism and a fascinating foray into alternate history.